Good morning crafty friends! It is blog hopping time with The Ribbon Resource and I am excited to share another Halloween project with you this morning. Half of the Ribbonistas have great projects to share with you today, and then we have a whole new set for tomorrow! There’s a little cute, there’s a little spook and there is a whole lot of crafty fun! If you’ve ever stopped by ScrappyCanuck Studios before, you will know that I love to craft with bright and bold colours. 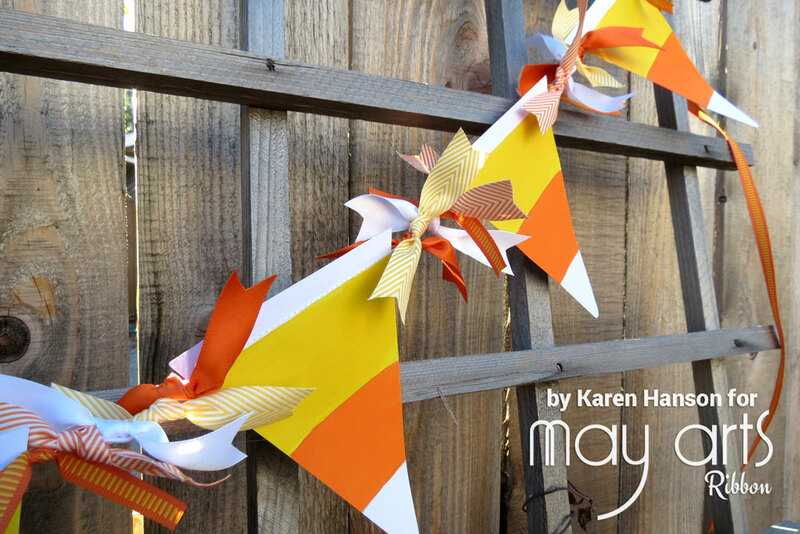 Halloween crafts don’t always fall into this category, but this fun little banner certainly does. 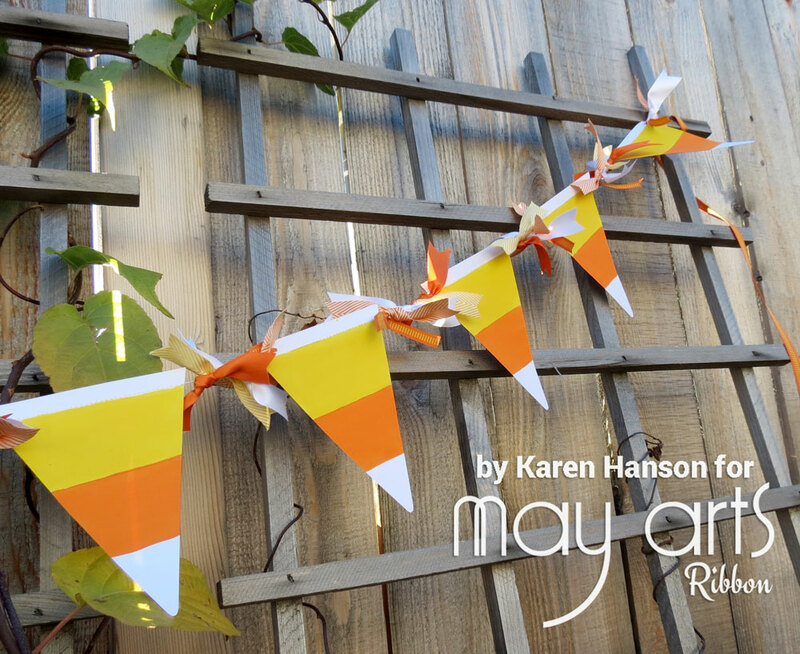 Inspired by candy corn, I simply took a plane white Artful Accents banner that I actually got from May Arts Ribbon (the wholesale sister site to Ribbon Resource) and got out my trusty acrylic paints for the colour blocks (each section is 2″ wide). Once it dried, I cut 4″ pieces of a variety of yellow, orange and white ribbons to tie along the top edge for some texture. It was that simple! Now, I have to tell you that critique #1 came from my six year old who feels like the candy corns should have smiley faces on them. She had her marker in hand and was ready to make the additions as soon as I hung it up (perhaps it is the influence of Shopkins in her life). I actually think it’s a pretty cute idea – what do you think? Karen Hanson <- You are here! 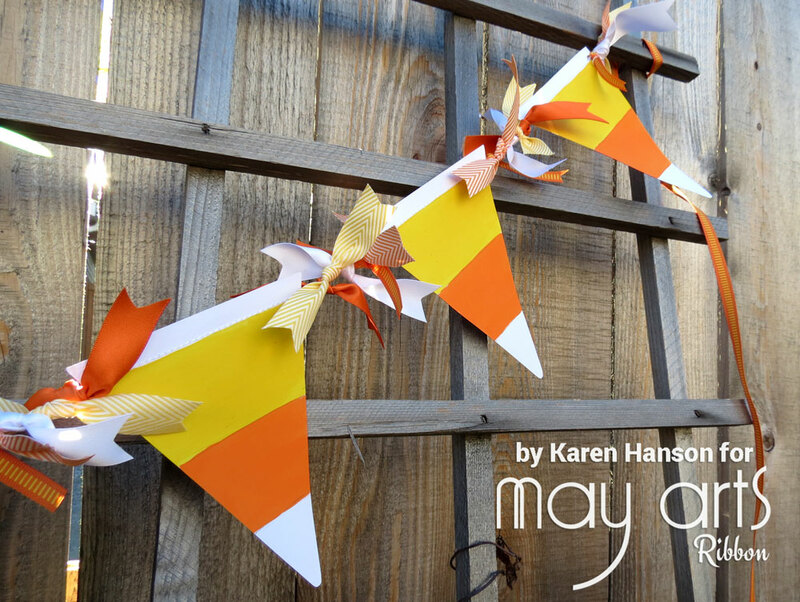 This entry was posted in Home Decor, May Arts Ribbon and tagged banner, candy corn, halloween, May Arts, ribbon resource by Scrappy Canuck. Bookmark the permalink. Loooove how festive the ribbon is between each flag! be cute on them also. That’s my kind of candy corn!! You NEED to let her put the smiley faces on them. I NEED to see that! How cute! This is so cute. I really need to start making banners for my office. So very cute – beautiful ribbons, of course. This banner is adorable! Love the candy corn theme! CUTE and TASTY banner Karen!! !